The Indian company, which has several gravure machines, has decided to take the step to flexographic technology and has done so by betting for the first time on a hybrid Comexi machine with which they will be able to print with Solvent Base (SB), Water Base (WB) and Electron Beam (EB) technologies. This step allows Vishal Containers Ltd. to adapt to the new trend of the Indian market, which opts for flexographic technology to the detriment of gravure printing. 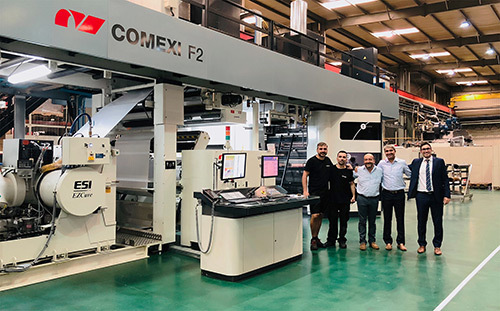 "We are proud to be able to install a machine with these characteristics in India", explains Jordi Puig, technical director of the Flexo business unit of Comexi, who adds that Vishal becomes "the first Indian client that has this technology, and the sixth in the world". In this sense, Vishal Patel, Director of Vishal Containers Ltd., expresses its satisfaction for being "pioneers in our country and betting on a sustainable technology that will bring added value to our products ". Vishal Containers Ltd. is a company with more than 30 years of experience whose main objective is to provide its customers with total packaging solutions under one roof. Located in an industrial area near Ahmedabad, one of its lines of work is the confectionery packaging material, among many others. The acquisition of the Comexi F2 MP hybrid represents for the Indian company its first commitment to a European machine, and they have decided to take the step for the trust generated with the Comexi team, as well as for the security of having the first quality service in flexo technology that Comexi offers in India.